In coronary artery bypass surgery — also called coronary artery bypass grafting, or CABG — surgeons graft a healthy artery or vein to a diseased coronary artery, beyond the areas that are blocked by plaques. This procedure allows blood to bypass the diseased part of the artery and improves the supply of blood to the heart muscle. Who Should Get Coronary Artery Bypass Surgery? Bypass surgery is very effective in improving symptoms of angina if you have stable angina. If you have major blockages in several coronary arteries, or blockage in the left main coronary artery (which is the most important coronary artery), or a very weakened heart muscle (a condition called cardiomyopathy, which you can read about here), bypass surgery can prolong your life when compared to treatment with angioplasty and stenting, or with medical therapy alone. Bypass surgery can also be helpful in people with acute coronary syndrome. Bypass surgery is performed under general anesthesia. The surgeon splits the breastbone to open the chest, then stops the heart using chemicals or cold (called hypothermia) so that he/she can attach the grafts without the heart moving around. Blood circulation is maintained, while the heart is stopped, using a cardiopulmonary bypass machine. Once the grafts are attached the heart is started again. The grafts used during bypass surgery usually come from veins from the legs (saphenous veins), or an artery from the chest wall (the internal mammary artery). Grafts using the artery often last longer than grafts using veins, and the artery grafts do not often develop stenosis, as vein grafts do. So internal mammary artery grafts should generally be used whenever it is feasible to do so (as determined by the patient's anatomy). It is fairly common for vein grafts to develop blockages due to atherosclerosis within 10 to 12 years of surgery. In recent years newer bypass surgery techniques are being developed called "minimally invasive bypass surgery." These minimally invasive procedures involve smaller incisions, and they avoid having to use the bypass machine. Unfortunately, minimally invasive bypass surgery is only suitable for patients whose diseased arteries can be readily reached with this approach. 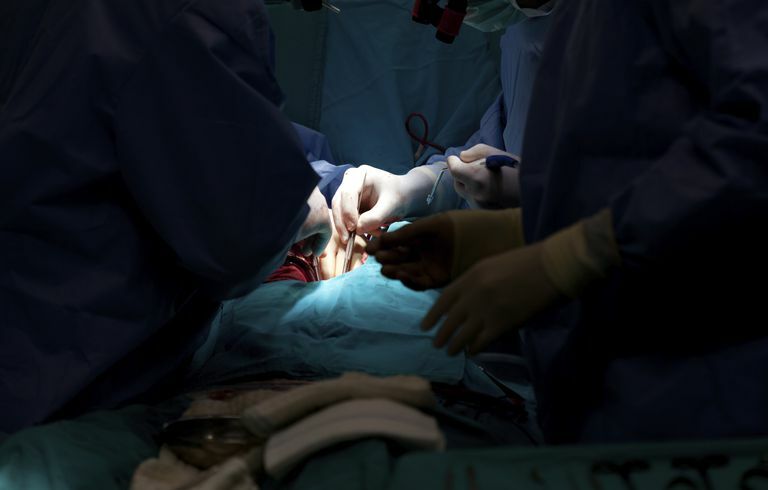 Coronary artery bypass surgery is a major surgical procedure, and patients often don't return to "normal" for many weeks or even months after surgery. It is common to experience poor appetite, weakness, and pain over the incision for a few weeks. Depression is seen in up to one of three patients after surgery, and unless the depression is recognized and treated, it can lead to a greatly prolonged recovery time. Other possible complications after bypass surgery include myocardial infarction during or right after surgery (in less than 5% of patients), weakening of the heart muscle (which is often temporary), arrhythmias (especially atrial fibrillation), pleural effusions (fluid accumulation between the lung and the chest wall), infection of the incision site, and a cognitive (thinking) disorder that has been termed "pump head" (after the cardiopulmonary bypass "pump" that supports circulation during the grafting procedure, and that some have speculated is responsible for these cognitive changes). Because bypass surgery carries such serious risks, it is usually reserved for patients who are likely to have their lives prolonged by the surgery or those whose symptoms of angina persist despite aggressive attempts at medical treatment. Eagle, KA, Guyton, RA, Davidoff, R, et al. ACC/AHA 2004 guideline update for coronary artery bypass graft surgery: a report of the American College of Cardiology/American Heart Association Task Force on Practice Guidelines (Committee to Update the 1999 Guidelines for Coronary Artery Bypass Graft Surgery). Circulation 2004; 110:e340.